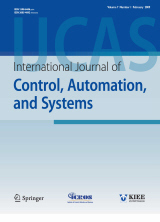 Abstract : "A novel active queue management (AQM) approach is considered for a class of TCP network systems in this paper. A sufficient condition is given and the corresponding control is obtained based on integral back-stepping technique (IB) and minimax method. The presented results not only are used to deal with the disturbances produced by UDP flows, but also can shorten the convergent time of the signals. Simulation examples are carried out to verify the effectiveness and superiority of the proposed algorithm."